“Bruno Prevedi was an Italian tenor, particularly associated with the Italian repertory. Prevedi studied in Mantua with Alberto Sorenisa, and in Milan with Vladimiro Badiali. He made his début as a baritone in 1958, as Tonio, but quickly retrained himself as a tenor, and made a second début in 1959, as Turiddu, again at the Teatro Nuovo in Milan. He sang widely in Italy, and made his début at La Scala in 1962, in Pizzetti's DEBORA E JAELE. He also appeared in Berlin, Munich, Vienna, Budapest, London and Buenos Aires. 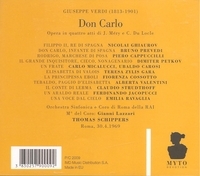 He sang the role of Pollione in NORMA in the Gran Teatro del Liceo in Barcelona during the winter season 1962-1963, then made his Metropolitan Opera début on 6 March, 1965 as Cavaradossi in TOSCA. During the following five seasons his roles included Alfredo, Manrico, Riccardo, Alvaro, Don Carlo, and Radamès. “Teresa Zylis-Gara studied for nine years with Olga Olgina. In 1954 she won first prize at the Polish Young Vocalists Contest in Warsaw which led to engagements to sing on the Polish National Radio and to perform as a soloist with the Kraków Philharmonic. In 1956 she made her professional opera debut with Opera Krakowska in the title role of Stanisław Moniuszko's HALKA. She returned there the following year to portray the title role Puccini's MADAMA BUTTERFLY. In 1958 Zylis-Gara won 2nd prize at the Concours of Toulouse and in 1960 she won 3rd prize at the International Music Contest in Munich. The latter competition win led to her engagement at the opera house in Oberhausen and from this moment on her career was largely centered in Germany for the next decade. She continued her voice training in Germany with Dietger Jacob. She was offered a long term contract with the Dortmund Opera in 1962, singing there for the next three years. In the mid 1960s Zylis-Gara began to become a major presence on the international stage, beginning in 1965 with her debut at the Glyndebourne Festival as Octavian in DER ROSENKAVALIER. She later returned to that festival in 1967 to sing Donna Elvira in Mozart's DON GIOVANNI. In 1966 she performed for the first time at the Palais Garnier in Paris which led to a contract with the Opéra National de Paris through 1969. The year 1968 proved to be a banner year for Zylis-Gara. She made her Royal Opera, London debut as Violetta in Verdi's LA TRAVIATA and sang Donna Elvira for her debuts at the Salzburg Festival in the summer, the San Francisco Opera on November 8 and her Metropolitan Opera debut on December 17. Rudolf Bing, General Manager of the Metropolitan Opera, was highly impressed with Zylis-Gara's debut performance and offered her a long term contract with the company beginning in January 1970 with the role of Pamina in Mozart's THE MAGIC FLUTE. She remained on the Met roster for the next 14 seasons, portraying such roles as Countess Almaviva in Mozart's NOZZE, Amelia in Verdi's UN BALLO IN MASCHERA, Cio-Cio-San in MADAMA BUTTERFLY, Desdemona in Verdi's OTELLO, Elisabeth in Wagner's TANNHÄUSER, Elsa in his LOHENGRIN, Fiordiligi in Mozart's COSÌ FAN TUTTE, Leonora in Verdi's IL TROVATORE, Liù in Puccini's TURANDOT, Marguerite in Gounod's FAUST, Mimì in Puccini's LA BOHÈME, Octavian, Tatiana in Tchaikovsky's EUGENE ONEGIN, Violetta, and the title roles in Cilea's ADRIANA LECOUVREUR, and Puccini's SUOR ANGELICA and TOSCA. Her final and 233rd performance at the Met was in the title role of Puccini's MANON LESCAUT on March 31, 1984 with Vasile Moldoveanu as Des Grieux, Allan Monk as Lescaut, and Nello Santi conducting.